Feel every nuance of your music come through in shining detail with the Acoustimass 5 Series V stereo speaker system. 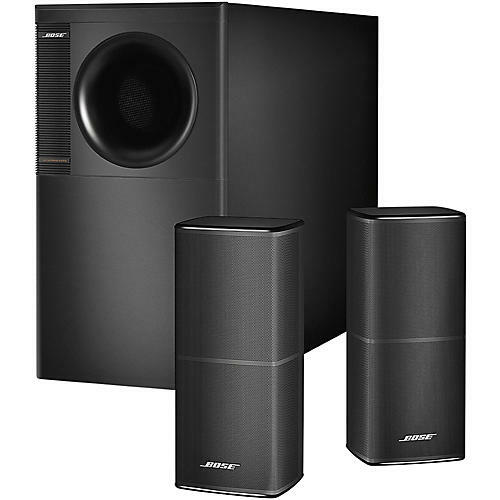 An ideal choice for larger rooms, the system includes two small Direct/Reflecting Series II speakers and a low-profile Acoustimass bass module which can be hidden away anywhere in the room. Direct/Reflecting Series II cube speakers sport a sleek, eye-catching design and feature drivers which are precisely angled to fill your room with spacious performance without "sweet spots." The speakers can also mount flush to the wall with optional brackets, eliminating nearly two inches of extension compared to the previous model. A solid bass line or a punchy drum beat helps a song come alive. The Bose Acoustimass module reproduces that kind of low-note performance with deep, clear precision at any volume—and without audible distortion. Place the module out of view, and all your sound will seem to pour from the tiny cube speakers. Pair the speakers with any receiver, and experience a consistent, quality performance. The system includes cables and connectors that are clearly marked for easy installation and setup. Order today to give your music spacious sound.